This is Page 1…Have fun with all kinds of painting, drawing, textures, materials, and application techniques. Painting or drawing “music” is a fun way to encourage children to creating abstract designs. Many artists, including the great Russian painter Kandinsky, believe that music and art can express the same feelings and ideas. There’s no wrong way to do this. Whatever a child creates is exactly right…his interpretation of the music. WET CHALK DRAWING: By dipping your chalk into wet paint, you can create wonderful works of chalk art that won’t smudge like regular chalk. 4.The beautiful part of this activity is that the paint “seals” the chalk so it won’t smudge on the paper. 4. Polish the picture by rubbing wax paper on it — to give it a shine. You can also use a chamois cloth or even a plastic bag. Mix “paint by combining food coloring with milk. Paint designs on one side—try and be creative with stripes, stars, designs. When changing colors be sure to remind kids to use different brush or swab. When complete-toast in toaster on light or under broiler. Can eat as is—-or while still hot butter and sprinkle with cinnamon-sugar. 1. Turn on a kitchen timer to one minute. 2. Using a marker, begin drawing but don’t pick up your marker. 3. Make one long continuous line going up, down, across and around. 4. When the timer goes off, color in the spaces. 1. Give children construction paper and several colors of thick tempera paint in shallow dishes. 2. Put paper in a shallow box- then dip a marble in the chosen paint color and use a spoon to scoop it out and onto the paper. 3. Now hold the box tilting it back and forth as the marble moves across. When there is no more paint, dip the marble again or get a marble in a different color. 1. Cut paper slightly larger than the base of a shoe box and place in the bottom of the box folding up the excess. 2. Dribble 3 or 4 different colors of fluorescent or ordinary paint onto the paper and drop in a golf ball. 3. The children have great fun rolling the ball around and around making tracks. 4. When complete remove the paper and repeat the process. Neatly color a coloring page– pressing the crayons or oil pastels hard on the paper. Lay the finished colored page on many layers of newspaper. Wet a cotton ball in cooking oil and rub it over the surface of the page. Make sure the page is thoroughly oiled– and then wipe off the excess oil. (Neither dry spots nor or overly soaked spots should be showing. Leave the page on the paper for several hours until the oil is absorbed. When the page is put in front of a window— the sun will shine through the translucency. Idea from Angie Dockter-Rochester, Mi. On the top section, draw a head. It can be an animal head or a person’s head, as weird as you like. Now fold that section back, so that it’s hidden, and pass it to the next person. Without looking at the hidden drawing, the next person draws a chest and arms of a person, animal, or creature—folds it back —and passes it on to the next person. Without looking at the previous pictures, that person draws a body – the stomach and hips. The last person draws the legs and feet. You can have more or fewer sections– depending on the number of people you have drawing. When complete, unfold your papers and see what unique people/creatures you have drawn! Find a pad of paper or a post-it pack. Start in one corner of the page and draw a stick figure. Lift up the page and draw the same figure on the next page, but move an arm or leg just slightly, and continue on each page of the pack. On each page, you’ll draw your stick figure just positioned a little differently. When you flip the pages with your thumb, you’ll have an animated stick figure! Have children finger print directly on a waterproof surface such as a table top or on a lunch tray. After they have created pictures or designs, they press paper on top of their paintings to make prints. For texture, they can sprinkle some salt onto the finger print. Tools can also be used with finger paintings, such as combs, Popsicle sticks or forks. 1. Prime the paints by placing a bead of water on each color. 2. Stick your thumb in a watercolor pan. 3. Make a thumbprint on the paper. 4. When it is dry, add lines to make it a person, bug, or something imaginative. PAINT THUMB PRINT PICTUES with Watercolor Tins. 1. Roll your finger or thumb over the ink pad. 2. Make a print by firmly pressing the inked finger or thumb against the paper. Use different fingers to make prints of various sizes. 3. Wash your hands and allow the prints to dry for a few minutes. Then draw faces and other details on the prints. Look through books or magazines for ideas for more fingerprint art. Draw picture with chalk and then brush over it with liquid starch. Watch it glow! COMB PAINTING Need: Combs, cardboard, flour, paint. 1. Cut a comb out of cardboard or use a real one. 2. Mix flour and water to a smooth paste and add paint to color. Spread the paste on paper and draw the comb over the paint. 1. Draw with white glue from a squeeze bottle on a matte board – or other cardboard type square. 2. Squeeze out thick, bold lines. 4. Rest the glue design in the tub of salt. 5. Cover the glue lines with salt. Shake off excess. Repeat with more salt to be sure all the glue is nice and thick with salt. 6. Return to the art table. 7. Gently touch the tip of a brush covered with watercolor paint to the salt. 8. Watch the paint color zoom through the salt. (The color diffusion part is science) You can change the application of colors any time. The colors will mix some. 9. Let the design dry. 10. The salt & glue will dry hard and crisp. Caution: If the matte board is handled too much, the salt will fall off and be crumbly. You can display it with clear plastic wrap pulled over the design and taped on the back of the board — Or in a zip lock baggie. 1. Paint a picture with wet, colorful areas. 2. While the paint is still wet and in puddles, crumple a sheet of plastic wrap and smush it down onto the wet paint. 3. Don’t move the plastic around…just press it flat onto the paint. 4. Set the painting aside to dry for an hour. 5. When you come back and pull off the plastic, you will discover unusual and beautiful patterns in the dry paint beneath. 1. Draw a design with white crayon on white paper….this is hard to do because it’s difficult to see what you’re drawing. 2. Create a really wild design with lots of scribbles and dots and zigzag patterns. 3. Paint over the top of your “invisible” drawing with bright watercolors. Like magic, the drawing will appear in all its glory. Paint your favorite colors onto the bubble wrap. Lay your paper on the bubble wrap and gently smooth with your hands. Peel back the paper. What do you see? Tip: Bubble wrap prints would make a nice background for your next art project. 1. Spill glue onto waxed paper in odd shapes. 2. Let the glue dry until it is hard and clear. 3. Color the dried glue with fine point markers. 4. Remove the shapes from the paper. Hang them in windows…from mobiles…or even around your neck! Discuss how Georges Seurat used dots to make paintings…specifically how he used primary colors placed NEXT to each other instead of mixing colors. Tape the edges of the paper with drafting tape. Sketch basic landscape with a pencil. Wet the paint with a brush, dip the q-tip in water and dip it into the paint. Pressing down lightly will make a small dot, more pressure will create a larger one. Have children try to fill up as much of the paper as possible with color. Remove the tape when the painting is dry. Pointillism is a method of making a color by combining tiny dots of colors. To make an area appear green, you would fill it with points or dots of blue and yellow. The idea of pointillism is not to physically mix colors. Plan a design or picture. Sketch it on drawing paper. ‘Color’ each area by making dots of color. Use the point of your crayon, and place the dots close together. Remember to mix dots of 2 colors to form the color you want. Stand away from the finished picture, and you will see that the dots blend together. Have the children draw on their paper with shoe polish applicators as if they were using giant magic markers. Dots can be made by picking up the applicators and then pressing them down on the paper. Have children use one color first; then use 2 or more colors to mix and make new colors. Make pastel colors by gently taking off the sponge applicator tops. For white shoe polish and add a few drops of food coloring. When the shoe polish is gone, wash out the container and refill with a watery tempera paint. Put white shoe polish onto a brown shoe polish tree and add food color into the white polish for the BLOSSOMS. Use brown shoe polish for puddles and glue paper pigs or ??? in the PUDDLES. Make white CLOUDS and white WAVES with brown sandy BEACHES. Paint white GHOSTS on black paper, black on orange paper. SNOWMEN, SNOW SCENES on blue paper with white polish. Pastel shoe polish onto ovals for EASTER EGGS. Fill bottles with watery tempera paint when they are empty. 1. Take 1 baby wipe and about 4 rubber bands for each child. 2. Tie the bands very tightly around different sections of the baby wipe. Children can roll baby wipes or fold them in different ways before they tie them. 3. Next, have them put the gloves on because it does get a little messy. 4. Place the baby wipe on some scratch paper and color between the rubber bands with the different color markers. Make sure children press the markers to the wipe — so the ink will go all the way through. 5. Next, carefully cut the rubber bands off of the baby wipe. The results can be amazing! 6. Let them dry and then mat and hang up! Cut out interesting pictures from magazines. Next, combine a packet of gelatin with one-half cup of water. Stir to dissolve the gelatin completely. Now, use a paintbrush to apply the gelatin to the back of each picture. Allow the pictures to dry wet side up on a piece of waxed paper. To use your stickers, just lick the back of each one; and apply. Easy and fun! 1. The small box of unflavored gelatin usually contains four packets – enough to make four batches of stickers. 2. For more fun, try turning computer printables or your own artwork into stickers. 3. Stickers made from magazine pages will not be acid-free, and therefore may not be well suited to scrapbook use. Choose a color you want to work with, such as red. 1. Have the children look through magazines and tear out pictures of red items (Just the red parts-and all shades of it). 3. Repeat the activity on other days with other colors. 4. Can also do this on cardboard and modge podge over paper…I did one on a canvas and it really looks fantastic! It’s NOT just for little kids!!! TIP: This could be an on-going project. It can take awhile to gather all the pieces of colored paper to modge podge the collage. 1. Hold three crayons together so their tips are flush against a table top. 2. Tape the crayons together to make a Rainbow Crayon. Make several of these. Materials: Small paper plates, play dough, feathers, pipe cleaners, pony beads, cereal with a hole in center… Directions: Give each child with a small paper plate containing a ball of play dough about the size of a golf ball. Have the children flatten the ball out just a bit. Provide the children with a variety of colored feathers, pipe cleaners, google eyes, pony beads, cereal, nature items, etc. Some things they can do: Children can wrap the pipe cleaners around pencils or their fingers to make spirals; thread the beads onto the pipe cleaners and stick the feathers and pipe cleaners into the play dough. Now, step back and watch them create some of the most interesting sculptures!! 1. Sprinkle Kool-aid crystals onto a piece of paper. 2. Have children spray water from a spray bottle onto the paper. 3. Use different colored kool-aid mix. 4. For added adventure, you may choose to take children out into the rain with a piece of paper that has Kool-aid on it. Look for different and unique designs in outside surroundings. Put several small samples on a large piece of paper by placing the paper on the object and rub across it with the chalk. Some ideas: Trees, pavement, patio brick designs, corrugated lawn furniture, wood siding, and tile flooring. It would be great if there was masonry with form/design on it! Spray shaving cream on a wet paper and allow the children to sprinkle on the color of their choose. Spray the shaving cream on a table surface, plastic placemat or cookie tray. When each child is finished experimenting with color and shape press a paper on his or her shape. 1. Let child freely paint with liquid tempera onto glass. It is a good smooth feeling. 2. When the child is finished painting, he/she may take a sheet of paper and press onto the painted glass to create a print. 3. When child is finished, they should sponge off the glass for the next child to use. Use fresh water and sponge. Have children put pieces of masking tape on their paper in any design. Children paint their entire paper with watercolors. When the papers are dry, help the children carefully pull off the tape. The white lines that appear will separate the colors, creating interesting designs. SOAP CARVING: Only children who can use a butter knife confidently should do this activity, and always with adult supervision. Using CAKES OF SOAP (Ivory works well) and butter knives—carve and whittle different masterpieces. When you have finished carving wet the soap slightly and rub it with your fingers to smooth it out more. Paint your soap if you want when you are finished or just leave it as it is. Materials: Crayons, knife for crayon shavings, an iron, paper, newspaper, waxed paper, scissors, string. 1. Shave crayons onto waxed paper. 2. Arrange the colors by pushing them into place. 3. Lay a piece of string at the top. 4. Cover with another piece of waxed paper. 5. Lay newspaper over both and press with a warm iron. 6. When wax cools, cut the waxed paper pressings into a shape you like, and hang it up. 1. Cut out pictures, patterns, or shapes, then arrange them on a sheet of cardboard or heavy paper. 2. Make interesting combinations by overlapping or rotating your collage snippets. 3. When you have everything in the perfect spot, carefully paste each picture to the backing. 4. Once your collage is dry, you can decorate it with markers, crayons, or pencils. On a sheet of plain paper make a dot to dot picture for the kids. It might be a simple heart or ball shape or as elaborate as a house or animal. You can trace the shape from many coloring books, then just place dots about 1 inch apart and number. Older kids do this a lot for the younger! OUTDOORS…INVITE CHILDREN TO PAIR UP AND SIT BACK TO BACK so they can each see a different part of the grounds. In silence, have them spend 2-5 minutes carefully drawing what they see. When done, give them a few minutes to share their drawings and tell their partners about two or three things they saw. When it’s warm enough outside, it’s fun to “paint with water” on sidewalks and rocks…Also inside on chalkboards (NO paint–just water) It’s great for younger kids to practice writing!!! Also, try painting with a tiny brush and water on the lines of a drawing done with washable markers. It bleeds the “marker- marks”. You can use a Q-tip instead of a brush, to help control “over watering” the art. 1. Kids make a marshmallow sculpture by sticking toothpicks into marshmallows and building up from a base. 2. Advise youth to make a square base– by sticking 4 toothpicks into 4 marshmallows; Children then build their sculpture up from there. 3. Ask kids to try to build up and not have their sculpture lay flat on the table. (Although the younger the child the flatter the sculpture will be. Soak dried peas over night to be used as joints in the sculpture. The peas soften for the construction and then harden like tiny concrete balls as they dry. 1. Draw a simple shape or figure on the cardboard. Keep the details down to a minimum. Simple is good for this project. 2. Paint glue in a small portion of the design. Note: Do not use too much glue if your cardboard is not sturdy. It will curl. 3. Place beans of different colors in the portion with glue. 4. Repeat for the entire picture. 5. The result is quite beautiful and the children will have a piece of art they are proud to display. Need: Plastic tub lids, Glue, Assorted dry beans, peas, seeds, popcorn, etc. 1. Have children spread a layer of glue inside the tops of their plastic lids. 2. Have them place dry beans, seeds, etc. on the glue to create mosaic designs. Need: Cardboard, glue, dry spaghetti paste, seeds such as corn-beans –squash -peas – lentils, etc. 1. Sort each seed type into its own bowl or saucer. 2. Start by spreading glue on a small area of the cardboard. 3. Then set seeds into the glue, making your own arrangement. 1. Put out sheets of waxed paper, wax side-up for children. 2. Fold the paper in half and then unfold. Have kids arrange some small paper shapes on one half of the paper. 3. Have kids grate the crayons on top of their paper design. 4. When done–fold the other half of the paper — back on top of the collage. 5. Next—lay a cotton cloth on top of the paper and iron across the cloth. The heat should melt the crayon pieces and fuse them to the wax on the paper. The finished collage can then be cut into shapes and hung on windows to catch the light. Use a cheese grater to grate old or broken crayons. Place the crayon shavings in a container. Give each of the children a sheet of clear, self-stick paper with the backing removed. Have the children sprinkle crayon shavings onto the sticky side of their self-stick paper. As each child finishes, place a second sheet of clear, self-stick paper on top of the first. Cut the children’s Crayon Mosaics into one or more flower shapes or whatever shape they want. Hang the shapes in your windows. 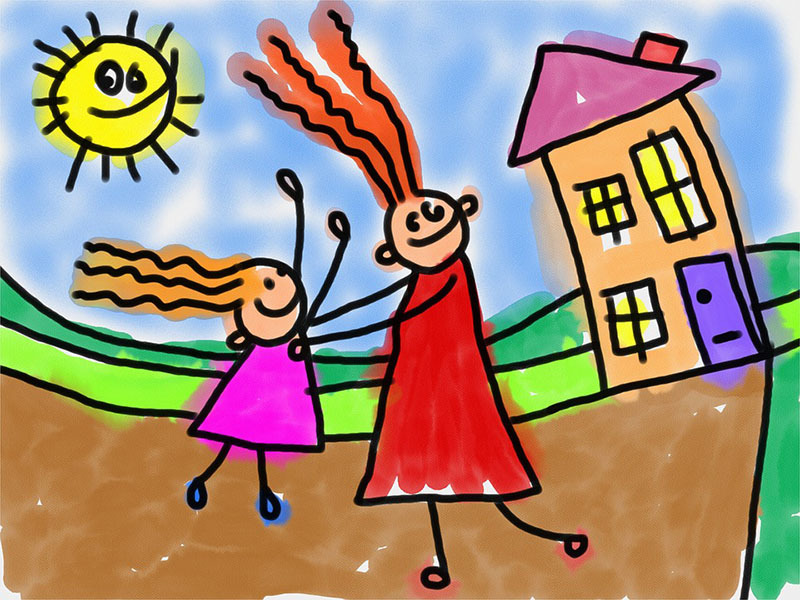 Children love to display their art work, and a mobile is a wonderful way to do it. A coat hanger makes an excellent base, and is particularly easy to hang when the project is complete. Have children decide what they’d like to display on their mobiles. Paper birds or fish they’ve decorated and colored brightly? Paper Snowflakes? Hearts? Sun, Moon and Stars? Maybe they want to cut out the letters of their names in construction paper. As long as the items are balanced evenly on the hanger, almost anything can be used. Clear fishing line, yarn, or even twine can be used to hang the objects from the bottom of the coat hanger. Tie each string securely to prevent the items from falling off, and then display from the ceiling or window. 1. Wash and rinse the gravel (a kitchen colander helps)…Spread out on towels to dry. 3. With glue, trace over the outline. 4. Press string or yard onto the glue lines, cutting where necessary to form corners and angles. 5. Glue gravel onto the picture —filling the spaces. You can use all one color, or use different colors for different areas. 6. If you wish to have a background, use crayons to draw and color one in. 1. Using the end opposite the bristles on a paintbrush, dip it in tempera paint. 2. Make dots around the paper. 3. Then use paints or markers to draw lines to connect the dots. 4. COLOR in the spaces. Pour condensed milk on finger-paint paper add drops of food coloring. Use red, blue and yellow and put a drop of red near blue and red near yellow, blue near yellow and then with one finger draw through the colors and condensed milk. You can talk about starting with 3 colors and having 5 when finished. Anytime during the activity the children can stop and “lick” their fingers. Young children can do this project. With smaller children you should use one color and they can use both hands. They’ll think it is really fun! 1. Paint the wax paper with the glue and water mixture. 2. Lay pieces of tissue paper on the glue, in whatever pattern and color you wish. 3. Lay the second piece of wax paper over the first and smooth. 4. Attach string to hang your stained glass in a window and let the sun shine through! 1. Cover table with newspaper or plastic tablecloth. 2. Have children place small amounts of tempera paint on their paper–in one or more colors. 3. Using the car, have children “drive” the car all over the paper. (Small Die-cast cars and trucks – such as Hot Wheels). 4. While running the tires through the paint, they’ll create “car tracks” and blend the paints together. 6. More fun! Fill buckets with soapy water– have “a car wash” when done painting! One half paintings are fun. Cut a big picture out of a magazine…a photo of an animal or a person or any colorful object works best. Then cut that photo right down the middle. Glue the half-photo onto a sheet of paper, then draw and paint the other half. This also makes a fun project to do with a friend. Each of you paints half of the same photo…you do the right side while your friend does the left. After your paintings are dry, remove the magazine photos and glue your two half-paintings together to make one, complete, teamwork painting! It’s a wild effect, especially with faces. First mix approximately ¼ cup BioColor® paint to 1 scoop (included in can) into a large container. Stir the mixture. Add ¼ cup warm water and stir. In a smaller size paint or Dixie cup, fill approximately ¼” full with BioColor®, bubble powder and water mixture. Place paint with BioColor® Bubble Mixture in middle of a sheet of paper. Place a long straw in the cup and blow. Colorful bubbles will overflow onto the paper creating beautiful art. Do not oversaturate paper with bubbles. If bubbles begin to slow down, add small amounts of water into paint cup to keep the action going! Make as many different colors as you want. You can also place a piece of paper over the top of the bubble and get very cool effects as well. Items from nature with a flat side: shells, rocks, leaves, twigs, branches, etc. TIP: Start collecting PAPER TOWEL TUBES to transport art! When children have something they want to transport without wrinkling, tubes work great! The tubes can be decorated with paint, markers, glitter, stickers, construction paper and crayons. Roll their pictures up and put inside to take home or to class. This also works to get homework “projects” back and forth. Glue several milk caps to the inside of the plastic lid. When painting…fill each lid with a different color. At times, if a purchased pizza is immediately removed from the box–the box may be clean enough to recycle! Children love to color with chalk, but their pictures can be ruined if the chalk smears. Protect children´s creations by coating them lightly with hair spray. 1. Torn up bits of old paintings and drawings you don’t want to keep. 2. Labels from boxes, cans, candy bars and bottles (Soak them off then dry them). 3. Used postage stamps, especially from all over the world. 4. Shiny Mylar foil balloons that have gone flat. 5. Short pieces of string, yarn, thread, twine, ribbon and lace (Short pieces…don’t keep too much). 6. Words cut out of magazine headlines and ads. 9. Seeds from flowers, kitchen spices, leftover garden stuff. 10. Used tickets from shows and sports events. 11. Things you can glue— collected from trips/vacations. Go to Page 2 for more wonderful Art Ideas! Display Walls also there! Check out our creative paint and coloring recipes!